Home» Road Tests » Mercedes S-Class 350 Contract Hire & Leasing Review. You Wouldn’t Think It Was A Driver’s Car – But Think Again! As far as cars are concerned, there’s a fine line between ostentatious flash and understated class and whilst the X-Factor judges seem to opt for the flash route, the captains of industry and heads of state don’t much care if anyone else is impressed or not, but they do want the absolute best in comfort and quality and that’s exactly where the Mercedes flag-ship S-Class fits in so perfectly well. Its funny writing a road test on a car that’s probably more famous for how fabulously comfortable it is in the back, than how it is to drive, and of course we are going to jump in the back to sample the “business class” luxury and let you know how the privileged few feel being chauffeured around in one. However it wouldn’t be us and it wouldn’t be a road test unless we got behind the wheel of this leviathan and found out if you have to be a chauffeur to climb into the pilots seat, or if the big German is a real alternative to one of the other big saloons around. The Mercedes S-Class has been the bench mark by which all other big executive saloons are judged for years now and whilst we started off, looking at the S-Class as some hugely expensive car, we ended up seeing it very differently and whilst for sure, the price tag which ranges between £60,000 and £164,000 isn’t for everyone, it compares pretty well with an Audi A8 which can be over £94,000 in standard form and the big Bavarian 7 Series BMW, which starts in at over £58,000 and climbs to around £105,000 depending on the spec you choose. Go for an even posher badge and you could be looking at the Bentley Continental which starts in at over £120,000 and can run over £150,000, or the massively expensive Maybach that can cost you up to £366,000, so in some ways, the S-Class is an absolute snip!. The Mercedes name first appeared in 1926, but it can trace its ancestry back to the early 1900’s and in that time, busses, vans, trucks and of course cars and since 1910, all of them have the 3 pointed star adoring the radiator at the front of the vehicles. Folklore says that Gottlieb Daimler marked a 3 pointed star above his own house on an aerial picture postcard of Cologne and Deutz and later wrote to his wife that this star would one day shine over his own factory to symbolize prosperity. Wanting to use every angle and write every meaning into the three point star, Mercedes also say it was supposed to symbolize Daimler’s ambition of universal motorization – “on land, on water and in the air” and there’s me thinking it was a “gun-sight”. Big cars aren’t anything new to Mercedes and some of you might remember the huge 600 class limousines, one of which was famously owned by John Lennon, but he wasn’t alone in his passion for the car as people as diverse as the Pope, to Coco Chanel, Hugh Hefner, Elvis Presley and even communist leaders such as Fidel Castro and Leonid Brezhnev who were clearly happy to let the poor people walk, whilst they wafted around “we are all equal” luxury. Even now, the car still hasn’t lost its magic, because still today people like Jeremy Clarkson and Rowan Atkinson do, or have owned a 600 Mercedes. Recently, the Presley car sold for $126,500, whilst the ex John Lennon car is being offered on-line at an eye watering £320,000. Moving forward to the 70’s and the first S-Class, which stands for “Sonderklasse” which means “Special Class or In a Class of its own” and in automotive terms effectively means a specially outfitted car (I knew you needed to know that). For a big car, the first S-Class or W116 as it was known sold in decent numbers, with 473,000 of them finding customers between 1972 and 1979. The new S-Class (the W126) ran from 1979 through to 1991 and introduced Coupe’s into the range and ended up as the most successful S-Class in Mercedes history, selling over 818,000 saloons and a further 74,000 coupes. Growing even bigger in size, the S-Class from 1991 to 1999 was the W140 and cost a whopping 25% more to buy than the older W126 version and it was made famous, because it introduced “double glazing” into cars for the first time, along with self closing boot and doors and the car found itself being the test bed for many later standard items, such as air-suspension, which could be chosen as an option on the W140. 1999 saw the introduction of the W220 which was completely restyled and available in saloon only and really took the product forward in terms of hi-tech equipment. If the older S-Class were ever considered as dull, this car certainly wasn’t, it was a more modern, lighter, looked more “of the moment” and became a car you simply wanted, rather than needed to have. Running until 2006, the car sold 485,000. Today’s S-Class is the W221 and it’s the trickest, swishest S-Class yet and like its predecessor the W220, its only available in saloon (or sedan) and depending on your budget, you can specify from a 2.1 diesel which produces 204bhp, right up to an AMG 6.0litre 621bhp V8 version. The car really captured the imagination and the wallets of the upper classes and just as it was being launched; Saks Fifth Avenue in New York offered 20 special edition versions of the S600 in its Christmas 2005 catalogue. The cars were finished in mocha black, with almond beige interior, cost $145,000 each and they all sold in less than 7 minutes of being offered, but then, they were the first ever “new” S-Class being offered to private owners. This however set the trend and today, the same car continues to be equally popular and equally desirable. So getting into this car, we kind of knew our place and perhaps thought we were interloping a little and we even got the impression that the car itself didn’t think we were worthy enough, but would put up with us because hopefully we would say some nice things about it. Frankly, it shouldn’t have worried! as the big Mercedes, with its air-suspension simply glides over the roads, and has more in common with the “Land-Speeder” used in Star Wars, than with your everyday car and when you do hit the odd horrendous pothole, you kind of expect the driver “or captain” to announce that you’ve run into some turbulence and warn you to keep your seatbelt on. Inside the double glazed cabin is silent and its kind of weird, because there really isn’t any wind noise, or road noise and the huge lump up front that’s pulling you along is as quiet as a mouse (and by that, we mean the engine, not the driver). The S-Class is just a stunningly luxurious and pleasant place to be, with not just leather, but with gorgeous soft sumptuous leather which trims the spectacularly comfortable seats and spoils us completely and we only needed a tray of Ferrero Rocher to have confirmed to us that we had arrived in life. There are two versions of the S-Class and I’m tempted to say “large or extra large” and our car was the long wheelbase version with a further 13cm of space in which to sink back and dream of life always being that way. You really can lounge around in this car, there’s no knees up to your chin stuff and you can outstretch your legs completely and its just mega-space and mega-luxury and despite that, if you fancy hitting you wallet even harder, you can spec this car up even further and below, are just some examples of what you can nail on.. Adding an AMG trim package will cost you £3,425, or Passion Leather at £1,000, or Driver Assistance Package at £2,065 and maybe a front seat comfort package at £1,660 and the same for the back at £1,470. Seat memories will cost you over £2,000, whilst a sunroof will set you back a further £970, rear roller blind and noise insulating glass will top out at another £1,520 whilst climate, refrigerator, multi-function wheel, rear sun blinds, ambient lighting and closing aid for the doors will cost you £3,285 between them. Fancy a big-hit, well a Bang & Olufsen rear seat entertainment package will cost you an eye watering £8,585 and that’s just for the rear of the car, whilst the front gets nothing! So it’s not difficult to see that just these few bits could easily set you back over £26,000 and for that money, you could buy a brand new Mercedes C-Class! And that’s without messing with the outside of the car! Go for Mercedes special design studio upgrades by “Designo” and you can specify a Designo Selection Package, which will cost you £15,200 but if you cant afford that, you could just opt for the Designo metallic paint which costs £3,405, or choose from quite a range of “oh my god, I cant believe the price” extras, so maybe this car isn’t for me and you, unless the six numbers come up, but if they did? there isn’t too many better ways to spend your cash! Anyway, after a suitable amount of wafting around in the back, we figured it was time to get this thing on the road, and jumping into the equally luxurious driver’s seat and fully believing this thing is going to handle like an oil tanker we stowed the anchor and set off. How wrong could we be, for instead of it feeling like some gigantic unwieldy leviathan wallowing its way down the road, the S-Class was nimble and precise and being honest, as easy to drive as a car half its size and just a couple of miles into our test, we had already figured out that it wasn’t just the back seat passengers that had all the fun. The cars engine and transmission are superb and our car was fitted with the 258bhp V6 CDi mated to a 7G-Tronic automatic transmission and amazingly, it powered our S-Class from 0-62mph in just 7.2 seconds, topped out at the restricted 155mph but “you aint gonna believe this” but Co2 was just 164g/km and fuel consumption was almost 46mpg across the average and that’s stunning for a car of this size and makes it as economical as many everyday family hatchbacks. So in summary, the Mercedes flagship S-Class perhaps does not have the in your face impact of the new Jaguar XJ, but its easily as pretty as the BMW 7 Series and the Audi A8, so holds its own in the “poshest” of company and in some ways, its understated charm makes it more attractive than all three and as a bonus, there is very little difference between the look of the entry level S-Class, to the £160,000 top of the range model, so nobody is going to know what you spent, or how wealthy you are. 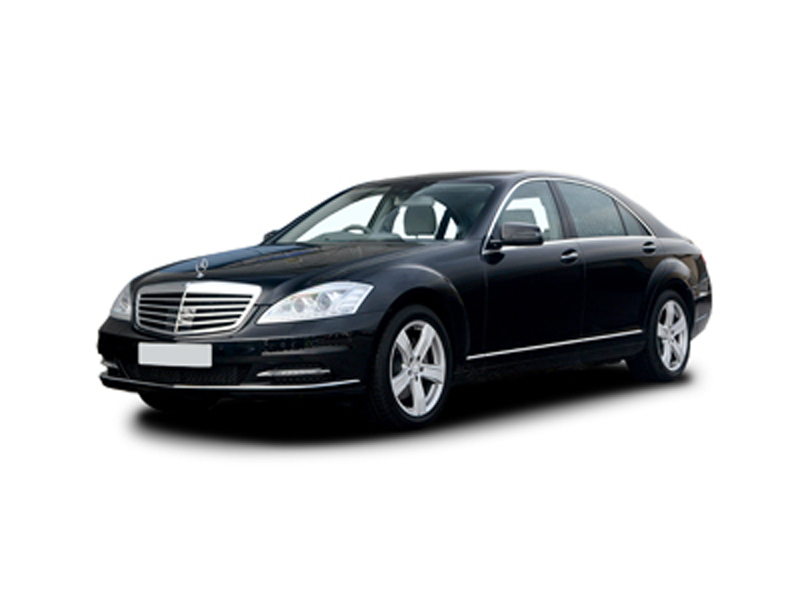 For a quotation on the Mercedes S-Class or any other Mercedes, please contact us.